Islamabad (March 03, 2018): The counting has been completed in all the 52 Senate seats across the country as ruling party PML-N backed 11 candidates swept in Punjab assembly, all four FATA seats and two seats- general and technocrat- of capital as per unofficial results. The PTI’s Chaudhary Sarwar secured 12th Senate seat by getting 44 votes from Punjab assembly after nail biting contest with PML-N candidate Rana Mehmdul Hassan, 40 votes. It was considered major upset in today’s Senate polls as ruling party was expecting to win the seat. The victory has paved the opportunity to PTI supporters to celebrate in Punjab for lonely winning seat. Another shocking results appeared in Sindh where MQM could only get single seat despite joint candidates while PPP swept all seats. The PML-N backed candidate Asad Junejo declared successful form general seat of Islamabad. He secured 214 votes out of 300 votes as his rival PPP candidate Raja Imran got 45 votes and PTI’s Kanwal Shozaib got 32. PML N’s Mushahid Hussain Syed has been elected as Senator from Islamabad on Technocrat Seat. He got 233 votes, while his PPP contender got 62 votes. According to unofficial and unverified results, the PML-N-backed candidates bagged 11 of 12 seats in the Punjab Assembly. The 12th seat was secured by PTI candidate Chaudhary Sarwar. Ishaq Dar elected on Technocrat seat from Punjab. Asif Kirmani elected on General seat from Punjab. Independent candidate Haroon Akhtar elected on General seat from Punjab. Sadia Abbasi elected on Woman seat from Punjab. Nuzhat Sadiq elected on Woman seat from Punjab. PML-N-backed Kamran Michael elected on Minority seat from Punjab. Hafiz Abdul Kareem elected on Technocrat seat from Punjab. Maqbool Ahmed on General seat from Punjab. Musadik Malik on General seat from Punjab. Independent candidate Zubair Gul on General seat from Punjab. 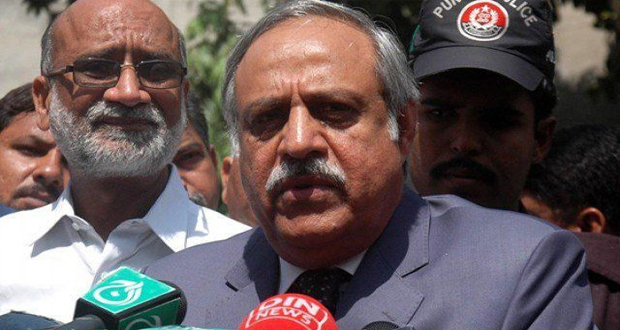 PML-N-backed independent candidate Rana Mehmood-ul-Hassan elected on General seat. PPP has won majority seats ftom Sindh and even PPP also grabbed the minority seat. PPP candidate mam Din elected on General seat. PTI candidate Meher Taj Roghani elected on Woman seat. According to unofficial and unverified results, Hidaytullah, Hilal ur Rehman, Shamim Afridi and Mirza Afridi have been selected as senator from FATA. All four candidates have won the election as Independent candidate. Independent candidate Hilal-ur-Rehman on General seat. Hidayat Ullah on General seat. Mirza Afridi on General seat. Shamim Afridi on General seat. 23 candidates for 11 seats of Balochistan province contested the polls for upper house of parliament. Independent candidate Anwaar ul Haq Kakar elected on General seat. Independent candidate Khuda Babar Baloch elected on General seat. 4.00 PM: The time for lawmakers to vote in the Senate elections ended at 4pm, however, votes can still be cast by those still present inside the assemblies. Lawmaker began voting at 9am across the four provincial assemblies and the National Assembly. Candidates contested for 52 seats from the provinces, Federally Administered Tribal Areas (FATA) and the federal capital. Following the Supreme Court’s ruling in the Elections Act 2017 case, Pakistan Muslim League-Nawaz (PML-N) candidates contested the election as independents. Rangers and Frontier Constabulary personnel were deployed outside the provincial assemblies and Parliament to provide security. The opposition Pakistan Peoples Party (PPP) is currently in control of the Senate but is expected to be replaced by the PML-N as the largest party. 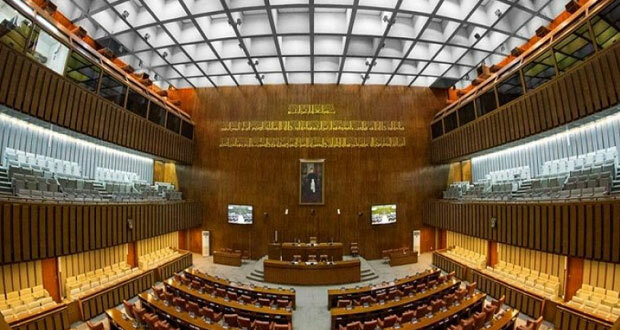 In the Senate elections, the four provincial assemblies vote for their representatives, whereas the FATA senators are elected by the MNAs from the tribal areas and the Islamabad senators by the National Assembly members. 3.30 PM: 58 members of Balochistan Assembly including JUI F’s Abdul Rehman Khetran have cast their vote. 2.25 PM: Former Interior Minister Chaudhry Nisar on Saturday said that government institutions should play their practical role to prevent horse-trading. He said that he is not playing cricket, thus no need arises for him to be on the front or back foot in the party. After casting his vote for the senate elections in National Assembly Nisar spoke to media and said he has not been part of any Pakistan Muslim League-Nawaz (PML-N) parliamentary meeting since four years. Why my absence has created issue this time, he asked. Chaudhry Nisar said that he had met ex-prime minister Nawaz Sharif but they didn’t have talk on vote. Responding to a question, the former minister said that this is not the occasion to discuss party matters. Meanwhile, Chaudhry Nisar memorized his friendship with Pakistan Tehreek-insaf (PTI) Chief Imran Khan as he was also cricketer in the past, however he said that said that he is not playing cricket, thus no need arises for him to be on the front or back foot in the party. 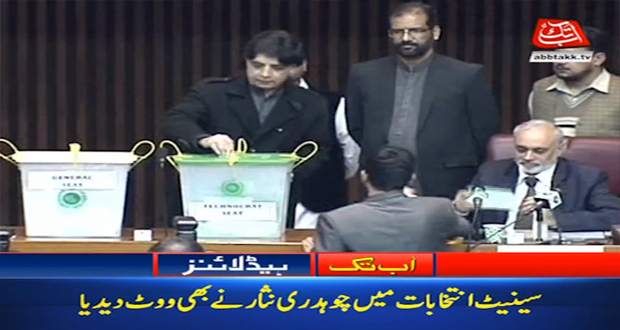 1:55 PM: A key PML-N lawmaker and former interior minister Chaudhry Nisar Ali Khan casts his vote at the National Assembly while Moulana Fazlur Rehman also cast his vote in the lower house of the parliament. Around 280 lawmakers cast their votes since the polling began at 9:00 AM today. 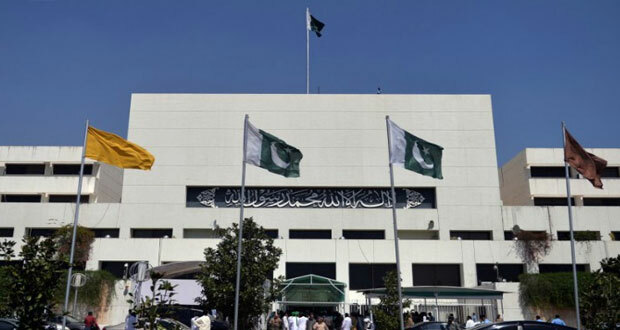 1:50 PM: Pakistan Tehreek-i-Insaf lawmaker Eng Hamid ul Haq on Saturday alleged the PML-N government for purchasing the FATA votes and giving each lawmaker around Rs 320 million for his vote. Talking to media outside the parliament house, the MNA said that the six FATA members had already made a group and Hilal Ur Rehman, Hidayat Ullah, Mirza Afridi and Shamim Afridi would be elected on four seats of FATA. “All matters were finalized by yesterday’s evening and each of the six lawmakers were given around Rs 320 million,” he alleged. 12:40 PM: State Minister for Interior Tallal Chaudhry and State Minister Abid Sher Ali cast votes in National Assembly. 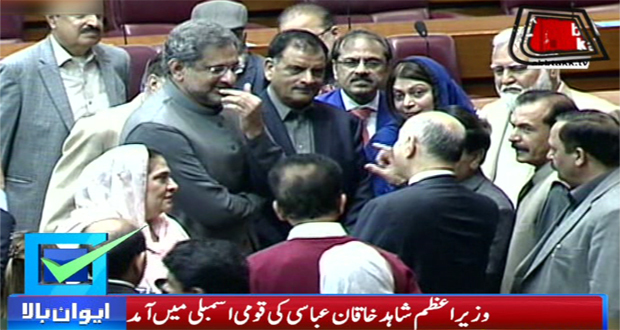 12:20 PM: Prime Minister Shahid Khaqan Abbasi casts his vote at National Assembly. After the vote, the parliamentarians gathered around him to discuss the situation and take selfies with him. The prime minister also met with the independent candidates supported by PML-N Kanwal Shahzeb and Raja Imran Ashraf. 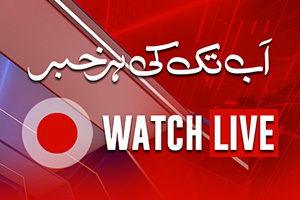 12:30 PM: Federal Minister for Railways Khawaja Saad Rafique and Deputy Speaker Murtaza Javed Abbasi cast their votes. 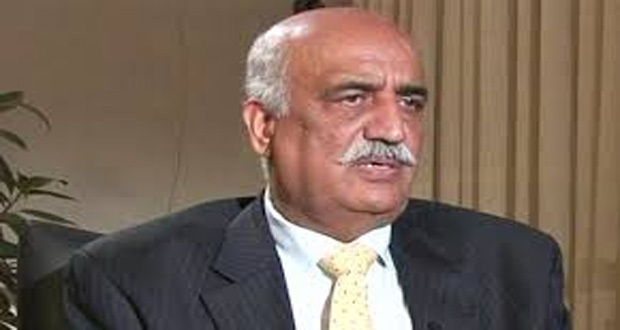 12:30 PM: Opposition Leader in National Assembly (NA) Khurshid Shah on Saturday said that the timely elections of Senate had buried the rumors of derailment of the system being spread across the country. Talking to media outside the parliament house, the opposition leader and PPPP member said that the assemblies will complete their tenure. He said that the parliament would be unable to benefit from the services of Aitezaz Ahsan and his absence would be felt. He, however, said that although absence of old friends has an impact but the politics had to continue. 11:46 AM: Five out of 11 lawmakers of Federally Administered Tribal Area (FATA) cast their vote. They include Bismillah Khan, Sajid Tori-who is also a Senate candidate-Bilal Rehman, G.G.Jamal and Nasir Afridi. 11:30 AM: Muttahida Qaumi Movement-Pakistan Leader Dr Farooq Sattar on Saturday said that the money matters would not affect MQM-P MPAs and only some organizational issues are left with the Bahadurabad faction which would also be resolved soon. 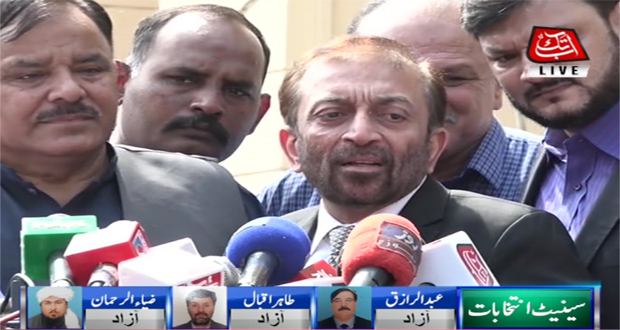 Talking to media outside the Sindh Assembly, Farooq Sattar said that the Senate seat issue was not the real issue as the major bone of contention is over who will run the organisation and the coordination committee. To a query regarding MQM MPAs participation in the chief minister house dinner and support for the PPP candidate in Senate polls, the MQM-P leader said that the MPAs are answerable to the party. “Our party is for the middle class and hope that the money will not deter them from their path,” he said adding that today is a test case for them. 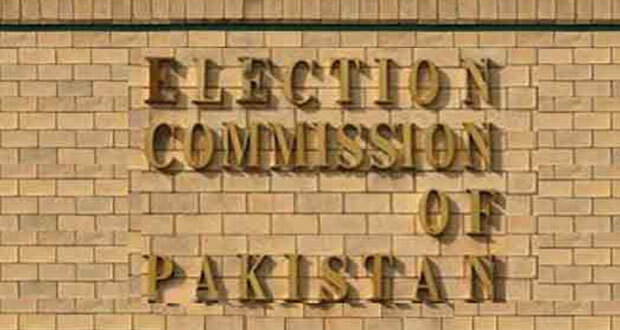 11:20 AM: The Secretary Election Commission of Pakistan has on Saturday warned that no comprise would be made on ensuring secrecy of vote in Senate polls. As per details, the secretary visited the polling booths in National Assembly, Islamabad and reviewed the arrangements for the polls. He said that complaints were received from some quarters of members coming out with the vote slips in their pockets. He said the returning officers have been strictly ordered to counter such activities. 11:15 AM: PPP lawmaker Sharjeel Inam Memon was brought to the Sindh Assembly on APC from prison. The secretary Sindh Assembly GM Umar Farooq has written letter for his production orders. 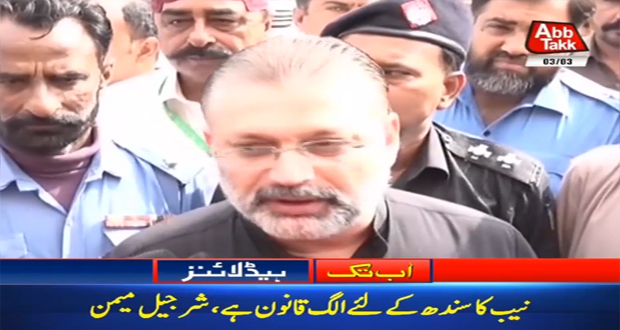 PPP’s Sharjeel Memon said that his party has nominated hard working candidates for Senate elections, adding that National Accountability Bureau’s (NAB) law in Punjab is different from other provinces. He said that he will not criticize judiciary like ex-prime minister Nawaz Sharif and Chief Minister of Punjab (CM) Shehbaz Sharif. 11:10 AM: The ECP has barred women lawmakers from carrying their handbags during the polling process. The decision has irked many women lawmakers. 11:00 AM: PPP MNA Sardar Ali Gohar Khan Mehar casts his vote in National Assembly. 10:54 AM: MQM-P Leader Amir Khan said that they would not disappoint their vote bank and hope for a victory in the Senate polls. “MQM is and will remain,” he said while talking to media outside the Sindh Assembly adding that those trying to create divisions among party ranks would fail in their attempts. He further said that their standing on the situation is not different from that of Khalid Maqbool Siddiqui. 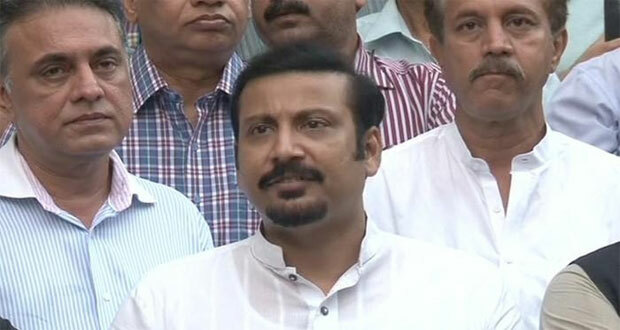 10:54 AM: Muttahida Qaumi Movement lawmaker Faisal Subzwari on Saturday arrived at Sindh Assembly to cast his vote. 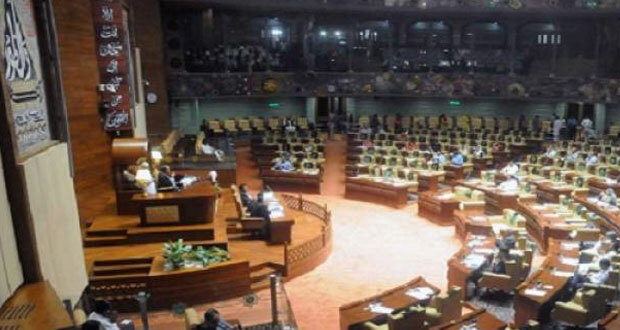 Talking to media in Sindh Assembly, Subzwari said that it was unfortunate that the two lawmakers of the MQM-P had joined hand with PPP for Senate Elections. “It is not good to benefit PPP for a single person (referring to Kamran Tessori) from MQM-P lawmakers,” he said . He said that PPP would be benefited from the rifts among the MQM-P factions in Senate elections. “Farooq Sattar and Khalid Maqbool Siddiqui are holding separate grounds and the situation that had begun from February 5 is unfortunate for the party,” he said. He said that they are in touch with PML-N, PTI and Functional League over joint candidates on women and technocrat seats. 10:53 AM: Prime Minister Shahid Khaqan Abbasi arrives at National Assembly to cast his vote. 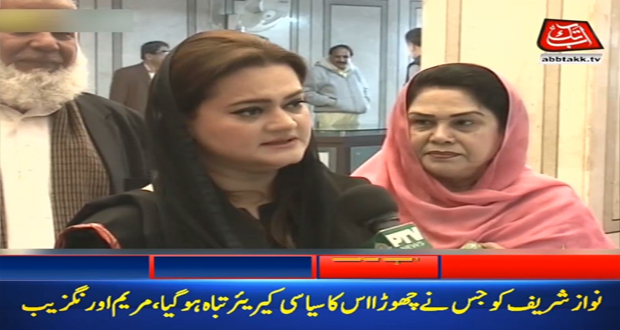 10:40 AM: State Minister for Information Marriyum Aurangzeb on Saturday has said that opposition parties will not get a single seat in Senate. Talking to media in Islamabad, Marriyum Aurangzeb on a query regarding possible defection by PML-N lawmakers, said that they had witnessed that each time someone chose to their turn backs on Nawaz, they destroyed their own political careers. “If anyone chose to do so today, they will have the same fate,” she said adding that people always welcome ex-prime minister Nawaz Sharif wherever he goes as he has done a lot for the general masses. She said that Pakistan Muslim League-Nawaz (PML-N) will emerge as winner in today’s polls. 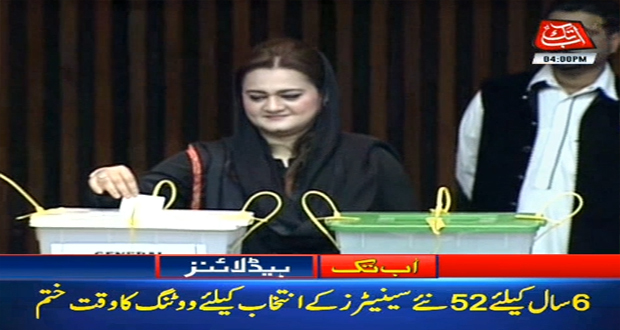 10:30 AM: PPP MNA Ghulam Mustafa Shah and Shazia Marri cast their votes in the National Assembly. 10:20 AM: Voting continues in Punjab Assembly. Over 105 lawmakers have so far cast their votes. PML-N lawmaker Birjees Tahir casts his vote in National Assembly. 10:20 AM: MQM-Pakistan Leader Kamran Tessori reaches Sindh Assembly. 10:00 AM: FATA Member in National Assembly Maulana Jamal Uddin casts his vote. 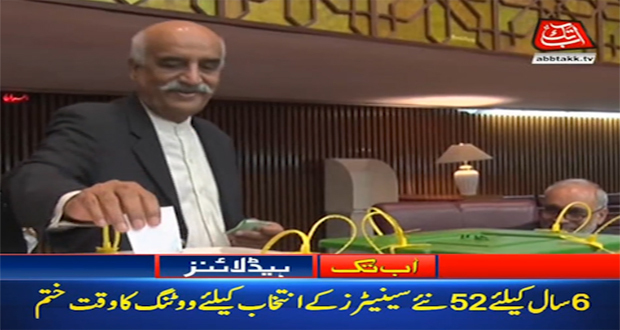 9:55 AM: Opposition Leader in National Assembly Syed Khursheed Ahmed Shah and PPP lawmakers Nafeesa Shah and Naveed Qamar caste their votes in the National Assembly. 9:45 AM: Former Chief Minister Sindh Syed Qaim Ali Shah casts first vote in Sindh Assembly followed by MPA Rubina Qaimkhani, who lost her son in a road accident yesterday. 9:40 AM: Opposition Leader in Sindh Assembly Khwaja Izhar said that they would cast votes on technocrat and women seats with the support of opposition parties. He said that all of the MQM-P candidates would cast their votes and they would give a tough time to the ruling party and it would not be an easy sail through for them in the polls. 9:38 AM: PPP Lawmaker Zia Ullah Afridi casts first vote in KPK Assembly. 9:14 AM: Speaker National Assembly Ayaz Sadiq casts his vote in the lower house of the parliament. 9:11 AM: Minister for Law Affairs Rana Sanaullah casts first vote in Punjab Assembly. Talking to media outside the assembly, Rana said that the PML-N candidates nominated by Nawaz Sharif would set a new tradition in the Senate polls. “If opposition parties would not work sensibly then the seventh general seat will also be acquired by PML-N,” he said this while rejecting claims of horse-trading and bargaining. PML-N candidate for Senate Asif Kirmani said that PML-N would clean sweep from Punjab province in Senate polls and how much vote every party would get will be evident after this poling process. He said that Nawaz Sharif is in hearts of masses and could not be removed from there and today is the day of victory for PML-N.
9:07 AM: PML-N lawmaker Rana Tanver casts first vote in National Assembly. 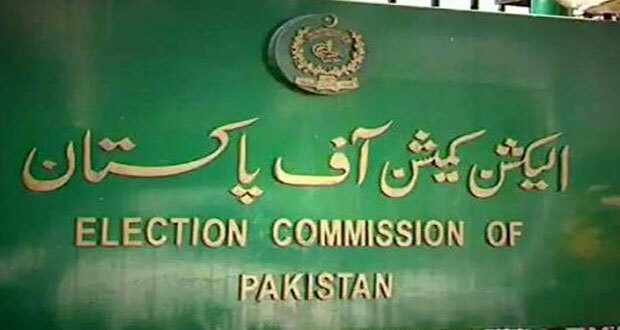 According to Election Commission of Pakistan, one hundred and thirty-five candidates will contest the elections. Twelve Senators each from Punjab and Sindh, 11 members each from Khyber Pakhtunkhwa and Balochistan, four lawmakers from FATA, and two members from the federal capital will be elected. Polling process will be started from 0900 and continued till 0400 in the afternoon. The new senators will take oath on March 12. The Election Commission of Pakistan, in a review meeting, has taken several decisions to ensure vote privacy during the elections. The Commission decided that returning officers will ensure that no voter exposes his vote’s privacy and neither be allowed to take issued ballot paper outside the polling station and in case of non-compliance the returning officer will cancel the ballot paper of such persons. It was also decided that all returning officers will have powers of full magistrate and they can suspend the electoral process by bringing such elements to ECP’s notice in case of irregularity. Rangers or FC personnel will also be deputed outside the polling stations. The election commission has banned the media coverage of Senate election, which will be held on March 03 in all provinces. The media release of election commission says that the media coverage of March 03 Senate polls have been banned and declared the parliament house as no-go-area for media. After receiving ECP orders the National Assembly secretariat has become worried, while the parliamentary reporters association have also refused to accept ECP decision. The parliamentary reporters association informed to speaker National Assembly that the decision would not be accepted as no precedent exists in past, therefore speaker should demand to ECP for scraping its decision. The parliamentary reporters association warned if the ban would not be lifted they would stage protest before the parliament on election day. The Senate consists of a total of 104 members — 23 each from the four provinces, eight from FATA and four from Islamabad Capital Territory. The 23 seats of each province break down into 14 general seats, four each for women and technocrats and one for minorities. While the total term for a senator is six years, half of the Senate retires after every three years. 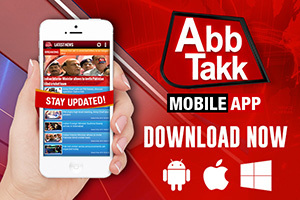 The Senate elections depend on the party positions in the provincial assemblies as well as the National Assembly. 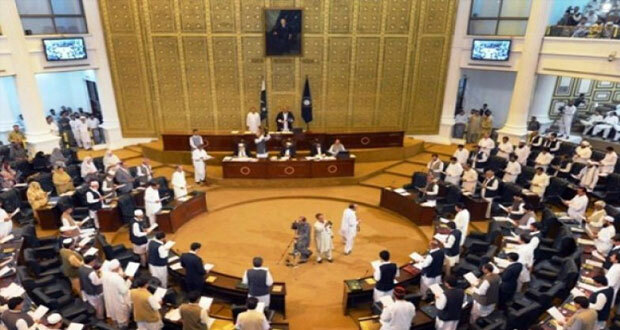 Four of the provincial assemblies vote for their representatives, whereas the FATA senators are elected by the MNAs from the tribal areas and the Islamabad senators by the National Assembly. A person seeking election to the Senate should not be less than thirty years of age and should be registered as a voter in an area or province from where he or she seeks election and should meet other qualifications prescribed under Article 62 of the Constitution. There are a total of 135 candidates contesting the 2018 Senate elections from the federal capital, Fata and the four provinces. Among the candidates, 20 are from the PPP, 14 from the MQM, 13 from PTI and four from Pak Sarzameen Party. In addition to this, 65 candidates will be contesting as ‘independents’, which includes the 23 candidates nominated by PML-N who cannot contest polls on their party ticket anymore. In 2018, 52 senators (who were elected in 2012) are slated to retire. The other 52 were elected in 2015 and will retire in 2021. Of the 52 Senate seats being vacated for election on March 03, 46 will be filled by the four provincial assemblies, 2 by the National Assembly, and 4 by lawmakers representing Fata. Among the candidates, 20 are from the PPP, 14 from the MQM, 13 from PTI and four from Pak Sarzameen Party. In addition to this, 65 candidates will be contesting as ‘independents’, which includes the 23 candidates nominated by PML-N who cannot contest polls on their party ticket anymore. Twenty candidates are contesting the polls from Punjab. Of these, 10 will contest for General seats, three for Women’s seats, five for Technocrats’ seats, and two for a seat reserved for minorities. A total of 33 candidates will contest the Senate election from Sindh. of which 18 will contest for General seats, six each for seats reserved for Technocrats and Women, and three for a seat reserved for minorities. 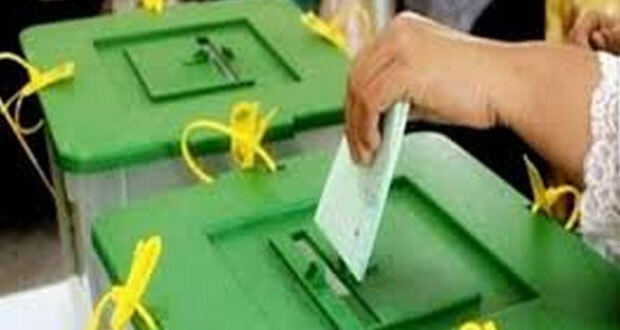 From Khyber Pakhtunkhwa, 27 candidates will contest the polls, of which 14 will contest for General seats, while five and eight candidates will contest the seats reserved for Technocrats and Women, respectively. The KP seat for minorities is currently filled. Twenty-five candidates are contesting the polls from Balochistan, of which 15 will contest for General seats, six for Women seats, and four will contest for seats reserved for Technocrats. The Balochistan seat for minorities is currently filled. How are the Senate elections held? The Senate elections are not direct elections, so you won’t be participating in the voting process (unless you’re an MPA or MNA). Instead, the ‘single transferable vote’ system of proportional representation is used. What is the single transferable vote? Under the single transferable vote system, voters cast a single ballot which mentions all the candidates they would like to see elected in order of their personal priority or preference (1, 2, 3, 4, 5 and so on). Each of these vote has a value. A quota calculated by the Election Commission of Pakistan determines how many votes each candidate needs to be considered elected. The votes received by each candidate are tallied in each count. When a candidate receives enough votes to cross the quota, the extra value of his or her votes is transferred down to lower priority candidates (in the order mentioned by the voters). The candidates who receive the fewest votes are eliminated and their votes are transferred to other candidates in the order of preference mentioned by their voters. The process of transferring votes from successful and eliminated candidates continues until all vacant seats are filled. The quota needed to be elected as a senator varies depending on which assembly and which seat the candidate is contesting for. For example, for a candidate from Balochistan fighting for the General seat, the required number of votes to win a General seat is 9. A senate hopeful from Punjab, on the other hand, will need 48 votes from the Punjab Assembly to win a General seat. This difference in the required number of votes is due to the different size of the two assemblies. The chart below shows how many votes are needed from each assembly to be successfully elected to a Senate General seat, assuming all lawmakers turn up to vote. As you can see by now, how many seats a political party holds in an assembly (and hence how many votes it controls) will determine how many senators it can elect. 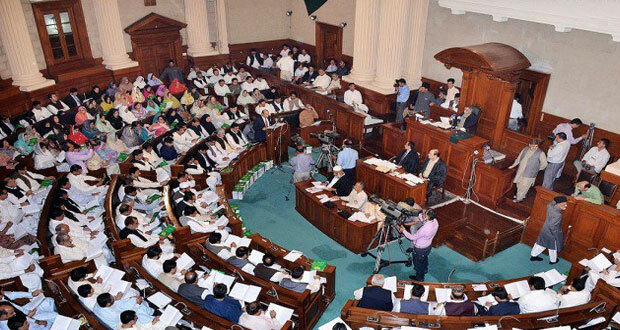 There are 371 total seats in Punjab Assembly; however, only 367 are currently occupied. Of these, 309 are occupied by members of the PML-N, 30 by PTI members, eight each by PPP and PML-Q members, five by independent lawmakers, three by members of PML-Zia, and one each by a member of Pakistan National Muslim League, Jamaat-i-Islami, Jamiat Ulema-i-Islam and the Bahawalpur National Party. The total seats in Sindh are 168, but there are currently only 167 lawmakers occupying them. Currently, 95 of them are members of the PPP, 50 are members of MQM, nine are lawmakers representing PML-F, nine PML-N, four PTI, one National Peoples Party and one is an independent lawmaker. The total seats in the KP Assembly are 124, but there are 123 lawmakers currently in office. Sixty one are members of the PTI, 16 are members of PML-N, 16 of Jamiat Ulema-i-Islam, 10 of Qaumi Watan Party, seven of Jamaat-i-Islami, six of PPP, five of the Awami National party and two are independent members. 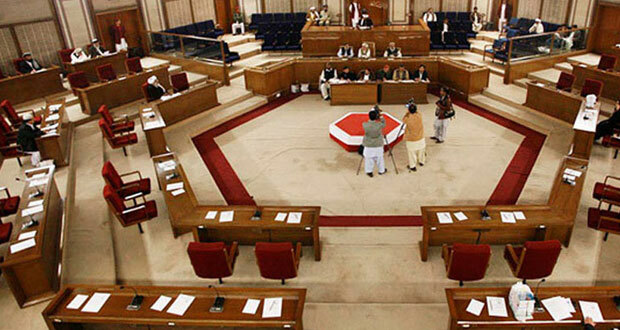 The total number of seats and lawmakers in the Balochistan Assembly is 65. Of these, 21 are PML-N members, 14 PkMAP members, five PML-Q, eight JUI-F, 11 National Party, two from the BNP, a lawmaker each from the MWM, the ANP and the BNP-A, and one independent member. At present, the National Assembly has 342 seats for lawmakers from across the country. It currently comprises 340 members. The treasury benches are occupied by 221 members: the PML-N enjoys a majority with 187 members, while its allied JUI-F contributes another 14. The PML-F adds another five, PkMAP three, National People’s Party two, and PML-Zia and the National Party have one lawmaker each on the benches. 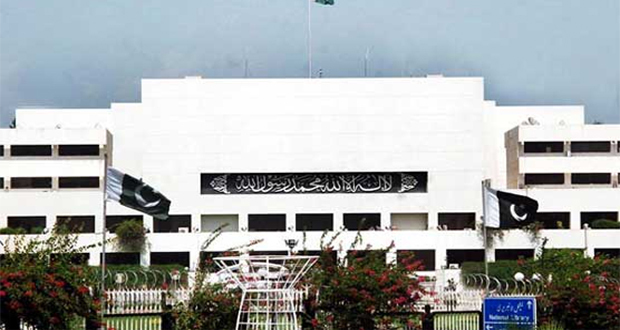 There are 119 lawmakers on the opposition benches, of which 47 belong to the PPP, 33 to PTI, 24 to the MQM, four each to the Jamaat-i-Islami and PML-Q, two to the ANP, and one each to APML and QWP. Three independent lawmakers are also part of the opposition. After the Senate has been duly constituted, a chairman and deputy chairman are elected by the members. They serve a three-year term. In the absence of the chairman, the deputy chairman acts as the chairman. A casual vacancy caused by the resignation, death, incapacitation, disqualification or removal of a member is filled through election by the respective electoral college. The then elected member holds office until the remainder of their predecessor’s term expires. Despite suffering a political setback in Balochistan, the ruling Pakistan Muslim League-Nawaz (PML-N) is all set to become the single largest party in the Senate after 18 years. 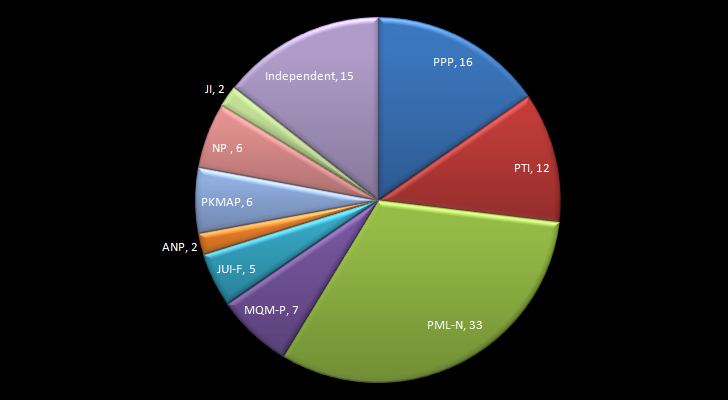 A careful calculation done on the basis of the party position in the National Assembly and the four provincial legislatures, which form the constituencies for the elections of members of the upper house, shows that if all MPAs vote in accordance with the party policy during the March 3 elections, then the PML-N will surely obtain more than 30 seats in the 104-member house. The PTI, which got representation in the Senate for the first time in 2015, is expected to double its strength after the March elections. The PTI is expected to win six out of 11 seats from the KP Assembly, where the party is ruling with 61 MPAs. Since the PTI and the Jamaat-i-Islami (JI) are ruling coalition partners in the province, the two parties can have an understanding on the distribution of seats and there is a possibility that the JI may also get one Senate seat from KP. At present, JI chief Sirajul Haq is the lone party senator. Besides the PTI and the JI, there are chances that the PPP and the Jamiat Ulema-i-Islam (JUI-F) may also win one seat each from KP. However, the chances of the Awami National Party and the Qaumi Watan Party getting any seat from KP are minimal. In Sindh, the PPP is expected to win eight seats, out of the 12, as the party enjoys the support of 94 MPAs in the 168-member provincial assembly. The PPP will be the biggest loser in terms of representation in the Senate as 18 out of its 26 senators are set to retire in March. The party is expected to win nine seats in the coming elections and its total membership in the upper house is likely to drop to 17. The contest for the remaining four seats in Sindh has been cleared now after the reunion of both MQM factions. Muttahida Qaumi Movement (MQM), which has 50 MPAs believed that will easily obtain the remaining four seats. The JUI-F is also expected to lose its position in the upper house. 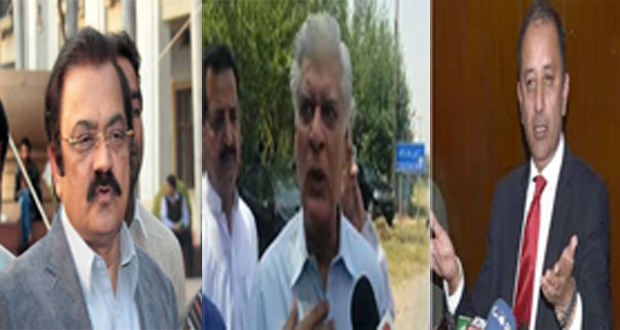 Three of its five senators are retiring in March and given the party position in the provincial assemblies, it is expected to get only two seats.